Organic Prostate Tea Reviews: Does It Work? What is Organic Prostate Tea? Organic Prostate Tea is a 100% organic treatment, containing herbal dietary supplement, which is meant to promote prostate health. It does not contain any caffeine. It is certified by the California Certified Organic Farmers (CCOF). The use of tea with nettle root comes from Europe. Traditionally, they used herbal teas made from stinging nettle root. Organic Prostate Tea is used to reduce difficulty while urination, which is an early symptom of benign prostatic hyperplasia (BPH). As nettle root has no strong taste, the combination of Ramón seed, cardamom and dandelion adds an interesting spicy flavour in the tea. 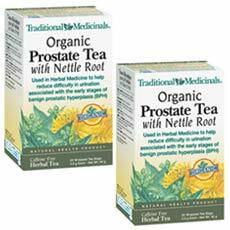 Organic Prostate Tea is made by Traditional Medicinals. Traditional Medicinals has been making herbal teas since 1974. The main aim of the company is to connect people with the power of plants. They differ from other companies, as the quality of their herbs is high, and they have trained herbalists. Their credo is to pass along the old wisdom of how to use plants for sustaining health. Traditional Medicinals supports the Non-GMO Project. Organic Prostate Tea Ingredients – Are they Safe & Effective? Organic Prostate Tea contains both medicinal and non-medicinal ingredients. Medicinal ingredients: each tea bag (2 g) contains organic nettle root (1500 mg.) Nowadays, the nettle root is considered to be a treatment of benign prostatic hyperplasia (BPH), or prostate enlargement. Like saw palmetto or beta-sitosterol, nettle eases the urination and decreases the possibility of frequent night urination. It also reduces pain during urination and inability to urinate. Non-medicinal ingredients: organic roasted Ramón seed, organic cardamom seed, organic roasted dandelion root. Organic Prostate Tea promotes prostate health; it eases urination, during the early stages of benign prostatic hyperplasia. This nettle root tea should be drunk daily, so that to support the prostate health. The combination of Ramón seed, dandelion root and cardamom seed, add some spicy taste to it. What are the Advantages of Organic Prostate Tea? The tea contains nettle root, which is known as a huge supportive for prostate health. The product is labelled by USDA, as being organic treatment. It is naturally caffeine free. Traditional Medicinal is certified by the California Certified Organic Farmers (CCOF). What are the Disadvantages of Organic Prostate Tea? Till now, there were no reported disadvantages of the Organic Prostate Tea. However, there are several drawbacks of using green tea frequently. Here they are: too much caffeine can cause frequent urination and insomnia. The use of the tea in large amounts can exacerbate liver and kidney problems. Also, there is some evidence that nettle may raise or lower blood sugar. Is Organic Prostate Tea Good For Prostate Health? It is good for prostate health, as it is meant to promote it. All the users were glad with the result they experienced. Recommended dose of the tea for adults: 1 cup (1 tea bag) 3 times a day. Pour 150 ml of freshly boiling water over 1 tea bag in a cup and cover it for 10-20 minutes. Then, gently squeeze the tea bag to release any remaining extract. You can add honey to sweeten it. The statements, which are written below, were not evaluated by the FDA. This product is not intended to treat, diagnose, prevent any disease or cure it. Consult your health care practitioner, if there are some side effects. The Organic Prostate Tea is meant to be used by adult males. What Kind of Reviews are Out there for Organic Prostate Tea? The users of the Organic Prostate Tea are very excited and pleased with the effect. There are no negative reviews of the users. In conclusion, it should be said that Organic Prostate Tea is one of the best solutions to support prostate health for males. It is all natural and caffeine free. It is also meant to be used to decrease the urination frequency and pain. The treatment has good feedback from the users.